I was handed my weekend packet and a goodie bag.We are all familiar with the triathlon goodie bag, it is a staple of race day registration. The typical triathlon goodie bag used to come in a plastic bag and has been upgraded over the years to a nylon sac provided by various sponsors. I usually open the triathlon goodie bag near a trash can so I can throw away most of what is in there. The goodie bag this weekend was presented in a canvas tote bag with a yoga mat on top. I was instantly intrigued. I did not open it near a trash can. Upon arrival to my room (which is lovely, by the way), I eagerly dumped out the contents on the floor to take stock. The first item, of course, is the yoga mat. I am not a yoga aficionado, but I certainly have many uses for a yoga mat. Namely, I use them under my bike trainer to catch the sweat and other miscellaneous mess (drinks, gels) that occur during indoor ride sessions. This was certainly a keeper. 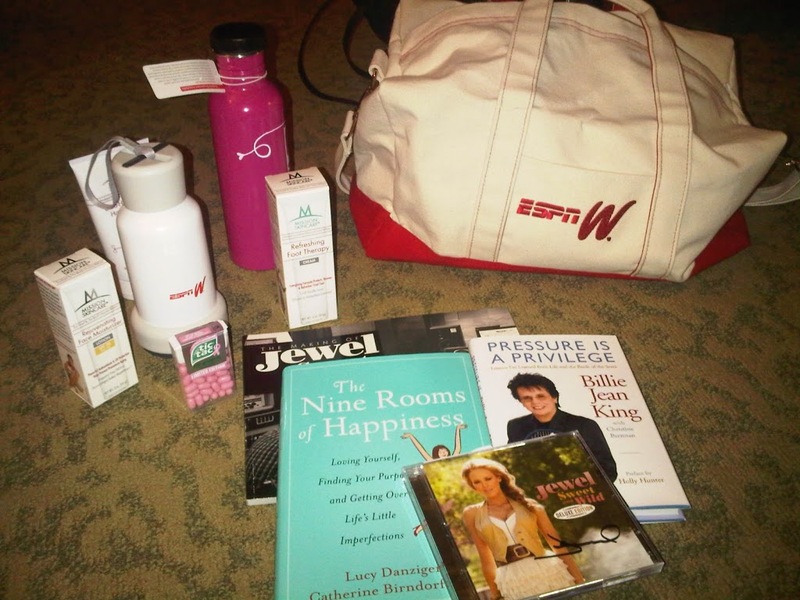 Instead of the Gatorade water bottles that find their way into triathlon goodie bags, the EspnW bag had two special water bottles. One is stainless steel and the other I cannot figure out (the white one in the photo). It comes with instructions, which I am sure I will eventually read. Billie Jean King is pioneer in women’s sports, and fought hard for equal pay for women in tennis. She figures prominently this weekend. Her book was included, and I look forward to reading it. The other book, by Lucy Danziger, sounds interesting and I will also put it on my reading list. On the website, the schedule of events listed a concert for Friday night. No artist was mentioned. When I saw the Jewel CD in the bag, I knew that she would be playing. How cool! Most triathlon goodie bags have sunscreen or anti-chafe cream, both of which I usually toss or give to somebody else. This bag included items from Mission: foot cream, lip balm, body lotion and face cream. Yes, I can use all of these (especially the foot cream. The dry Colorado weather has made my feet quite a problem) and I will bring then home to see if they can make improvements to my dry skin. WTC events include The Road to Kona/Clearwater magazine. Other events have their local publication. This weekend we were provided with ESPN (of course), Self and ESPN Rise. A very refreshing change. Finally, the pinnacle of any race bag is the race shirt. An ugly race shirt sends triathletes into a frenzy. If the shirt is not made of technical material then angry triathletes revolt. 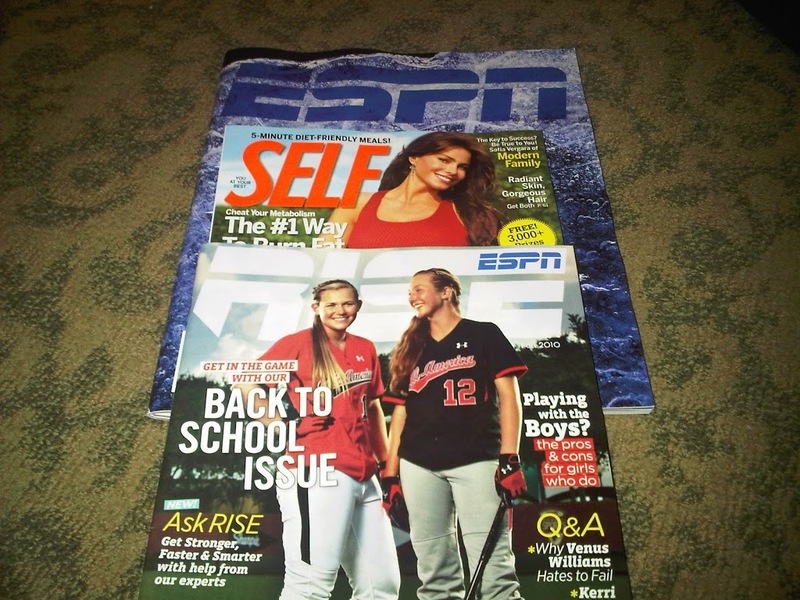 The clothing in the EspnW bag were provided by UnderArmour and Champion. A cute pair of shorts, capris and a shirt (made of technical material). I am not sure why they gave me an XL shirt though. A gift for Mark. The final item in the bag is Tic Tacs. They are pink. 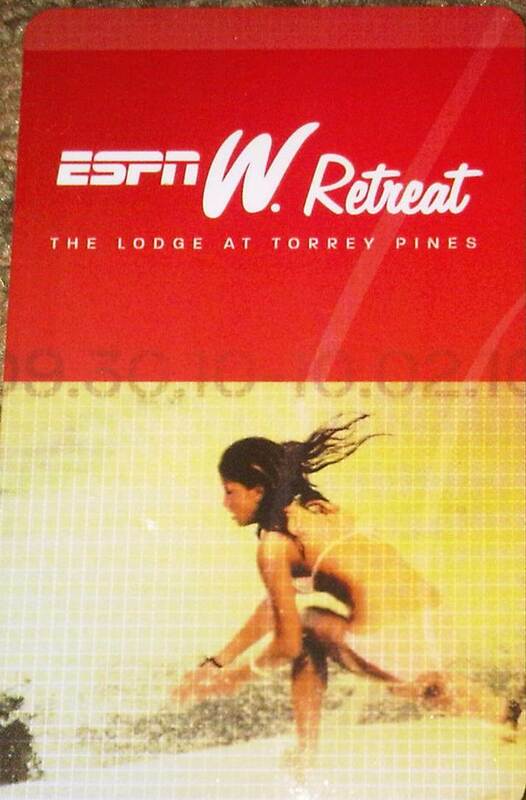 Update: I returned to my room after the morning activities and found a Nike bag filled with more goodies. The best, an iPod touch. More to come as the weekend unfolds. That is an awesome goodie bag! I’ll relieve you of the Tic Tacs (Mark won’t eat them, they are pink) and the shorts (for when I am back to a normal size, if that ever happens). You’re welcome. Fantastic! Look forward to hearing more about your weekend experiences!